Never before have we road tripped like we're road trippin' this summer. And with an infant, no less! I'm hoping to find enough activities to keep the boys (ages 4 1/2 & 2 1/2) busy so that I can juggle the needs of the three of them on our longer-than-is-probably-sane car rides. In preparation for these upcoming trips, I took a look at some Activity Cards from Usborne Books & More. I like these cards because they are easy to hand out individually (being cards and all) and they have a write-on/wipe-off surface so they can be used again and again. 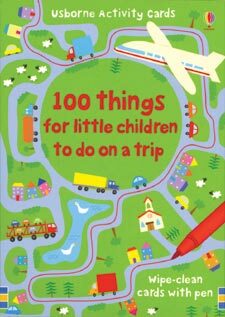 The 100 Things For Little Children To Do On a Trip set has proved to be lots of fun. 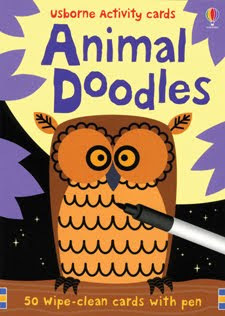 It has mazes, complete the picture activities, dot-to-dots and cards for imaginative doodling. We've pulled these cards out on afternoons when we're just looking for a little something to do and have made use of it on trips in the past. I noticed that Usborne had a new set - Number Puzzles - that I was curious to see. There are particular cards, such as "Caterpillar counting" where the child is supposed to write in the numbers which are missing in a sequence and there are cool cards with math problems involving sea life. 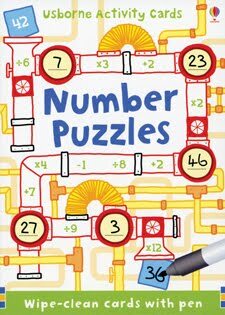 You count, identify prime numbers, figure equations and solve codes wrapped up in fun illustrated scenes. If you are looking for a way to make math fun, or if you have a number lovin' child (like I ironically do, being that I hate numbers) then you might want to take a look at this set! Animal Doodles was way more up our alley and perfect for our development at the present moment. After all - it's all about ANIMALS! Complete pictures, find animals, create them and just have fun! Like the other packages, this one includes 50 double sided cards for 100 activities total. This package was a hit for both our boys and so I've found a new distraction for the car rides! Usborne Books & More offer a great many activity cards. (You can click on that last link to take you to the activity card search page.) There are a great many options! Thank you Usborne Books & More for sending us Number Puzzles and Animal Doodles to try out. We appreciated the opportunity to look into them. Good luck on your road trips! Some of these books look promising.